I spent some of this afternoon pitting cherries. It’s a little tedious, but relatively mindless. On the kitchen prep chores, it’s way above peeling potatoes or carrots. Plus you can pop the periodic cherry in your mouth while you’re working. The cherries in question are montmorency cherries – apparently the most popular sour cherry tree in the US. I sure like them. They’re incredibly juicy, bright red in color, and have a tart flavor – lots of it. Some things I’ve noted about pitting cherries – they’re easier to pit when they’re cold, they’re easier to pit when they have stems on them, and warm cherries just picked from the tree are a LOT juicier than if you toss a bowl of them into the fridge overnight. The top of my stove was my workstation today – and it’s liberally covered in cherry juice now. 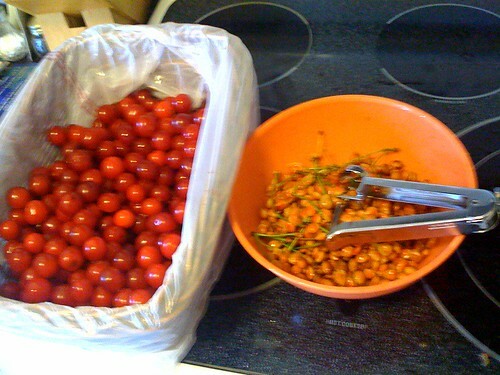 All told, I think we have 10 quarts of cherries – 8 of them pitted now. I’m giving 2 quarts to a friend to use for making cordial, and most of the rest are getting frozen. Karen and I might make a pie or a crisp tonight, but we’ll be keeping some of these back.